I knew Niccolo was going to need an outside videographer for the tv show series Liftoff and I couldn’t miss the smile a psych that would come along with seeing one of my best friends do his first ever wing suit BASE jump. I had to be there to make sure everything went well. I had been training all winter at my home in Yosemite and I felt super confidant I was going to be more then capable of getting some of the worlds best images. I was prepared to tackle the project full on. Wing suit videography is the worlds most dangerous pursuit and can only be done by a select few us who have paid our dues and put in the time. Many have died chasing this dream of making your friends stars. I had some uneasy feelings, but I knew I was working with some of the best and psyched people out there. I flew into Switzerland totally jetlagged from a wicked overnight flight and luckily arrived in some marginal weather. I took a couple of days to shake the trip of time travel and my first project was High Ultimate. High Ultimate is an awesome jump, which can be tracked and allowed for us to tone some skills. 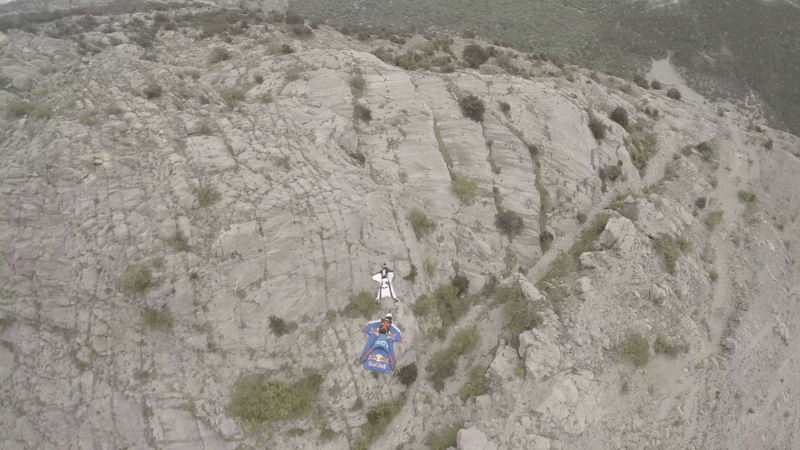 After shooting for a few days it was off to Mount Brento to do Niccolo’s first wing suit BASE. Working with a full production crew to capture Niccolo’s first jump was intense. We had to spend a lot of time organizing, planning, and of course adjusting those plans to what we could actually pull off. I was super excited to work with the Liftoff crew. 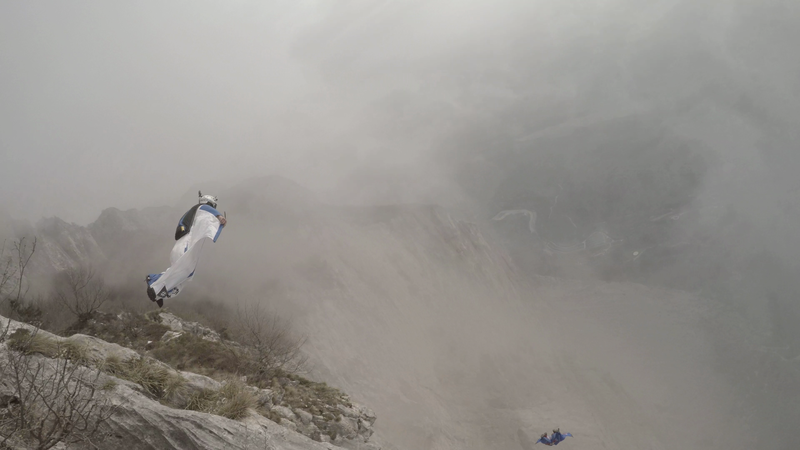 It was my gift to Niccolo to capture his progression and get the shot of his first wing suit BASE jump in 4K. I used three different cameras top mounted on my helmet. Everything went to plan. We lined up on the exit, counted to three, and “boom” we were of the edge and into flight. I nailed it! Every shot was spot on and Niccolo looked like a star. All that hard work had paid off when we landed and I could hear him scream a howl of full psych. His joy upon landing was fantastic. It felt really nice to share these tears of joy and moment of pure bliss with my homeboy. The gift of capturing joy like this and spreading it to the world is what I live for. I am super thankful to live this life of human flight. 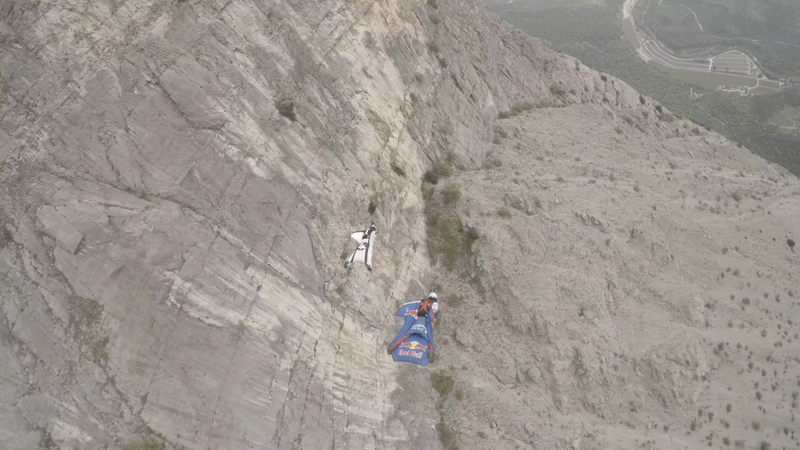 Here Dominik follows the boys off on Nicollo’s fourth wing suit BASE jump.